Audra Ellison, now Emily Porter, has had her mind wiped of all memories. She doesn't know why she voluntarily had her mind wiped, but she knows there was a reason. Moving on with her quiet life in Maine, Audra is adjusting to her new life. Meeting Luka at the local grocery store and then seeing a mysterious figure watching her has Audra becoming paranoid. Who can she trust? Has her past caught up to her? There is so much in this book that is so hard to explain. The story centers around the descendants of Elizabeth Bathory, a female serial killer from the 1600's (she's for real, I looked her up!). These descendants are known as the progeny in the book. For centuries they have been hunted and put to death. Audra is part of that line. Having to jump back into the life that she so willingly tried to erase from her mind is difficult and frustrating for her, but she knows that it is a matter of life and death. Both for her and for the man she has come to love. With no memories Audra is having to start all over on her quest to end the killing of the progeny. Secret sects, ancient secrets, life and death all chase Audra and her friends through Europe in her desperate attempt to follow clues she left herself before wiping her memory. 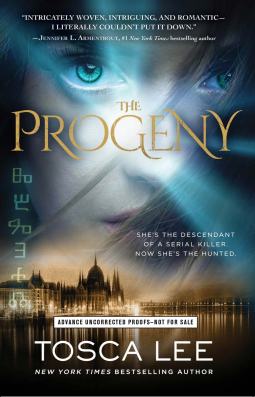 I loved the characters in The Progeny! Tosca Lee has a way of delving into the deep feelings of her characters. You can feel the agony tearing Audra apart, you can also feel the depth of love that Luka has for her. The suspense of trying to figure out why Audra wiped her memory is intense. And the evil that has set everything into motion once again is palpable. The story is convoluted and at times confusing, but that didn't keep me from enjoying every bit of it. And oh my word! The book ends with a major cliffhanger that left me stunned and desperate for the next book in the series. The last paragraph y'all! Seriously sent goose bumps up and down my arms! FYI: This book does have some curse words in it, so may offend some readers.